We just learned about how the subclavian veins bring deoxygenated blood back toward the heart. Those veins are connected to three smaller veins from the upper arm and shoulder area. The axillary vein, cephalic vein, and brachial veins. The cephalic vein goes up over the top of your deltoid shoulder muscle. 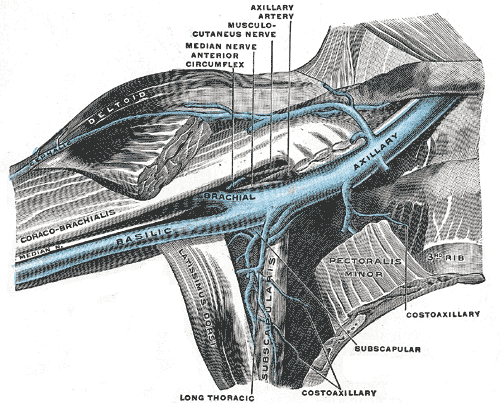 The axillary vein goes under your arm in your armpit. The brachial veins are smaller veins connected to the axillary vein, that go off toward your bicep muscle.